Get off the tourist trail and take some tips from these insiders. The Napa Valley is one of the world’s best-known wine regions, yet it still retains its unique (and sometimes quirky) charms and secrets. 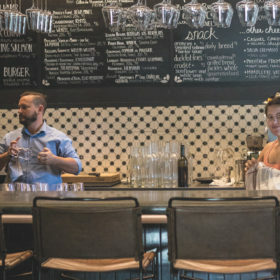 In an effort to get your nose out of a guide book and into a glass of wine, we turn to five locals for the inside scoop on Napa’s best locales from those who know them best. Click through and find out where to eat and drink the next time you’re in Napa. “Brunch is my favorite meal. Favorite spots include Boonfly Café at Carneros Inn [in Napa]—they have amazing jalapeño Hollandaise eggs Benedict. For pub grub, Norman Rose has killer hamburgers and beers on tap. “Head to Oenotri in downtown Napa for authentic Italian. All their pasta is homemade and they have gluten-free options. Bistro Jeanty [in Yountville] will forever have my heart for traditional French cuisine. My favorite is their famous tomato soup in puff pastry. Her go-to destination for shopping is downtown Napa. “Cake Plate has a very contemporary collection,” she says. She also recommends Betty’s Girl boutique (vintage finds) and Boho Lifestyle (artisan jewelry). The Ramseys met while students at Culinary Institute of America in New York’s Hudson Valley. They moved to Napa in 2011. They have a son, Graydon, who just turned two, and are expecting another child. For kids’ activities, the Ramseys suggest the many great parks in the Napa Valley, especially in Yountville. Hong trained as an Olympic-caliber gymnast before she discovered cooking as a teenager. She worked as chef de cuisine at the Restaurant at Meadowood, recipient of three Michelin stars, with Christopher Kostow. He just tapped her to helm The Charter Oak, his new, family-style restaurant, scheduled to open this summer. For wine tasting, “I take people to Charles Krug [in St. Helena], because we got married there. I love their lawn, and they do a lot of food and wine pairings. And my friends always like to see that pretty Italian winery—Castello di Amorosa,” styled like a 13th-century Tuscan castle [in ­Calistoga]. Visiting Napa Valley for the first time on a trip with his parents in 2000, Weinkauf did all the touristy stuff like riding the tram up to Sterling. He remembers being struck by the beautiful views. He now lives in Calistoga with his wife, Claire (cofounder of Picayune Cellars and owner of Claire de Lune Wine Marketing Consulting), and 17-month-old son, Hugo. Wine tasting at Robert Mondavi Winery leads off Weinkauf’s picks. “You feel like you’re getting a slice of history, plus there’s the quality of their winemaking. I recommend the reserve room, where they’ll pour multiple vintages. “In Calistoga, it’s still a small-town life—you have the Fourth of July Parade and the Lighted Tractor Parade near Christmas. Calistoga also has little wine shops like T-Vine, and W.H. Smith Wines. They’re worthwhile for expanding your palate. “A great all-round dining experience is Calistoga Inn, for either a burger or more formal meal. It’s approachable and family-style, with great outdoor and indoor seating—nice in summer or on beautiful winter days. A new restaurant just opened up in Calistoga, Sam’s Social Club—great food, great brunches.